Home Blog What skills are effective altruist organisations short of? Results from our survey. What skills are effective altruist organisations short of? Results from our survey. Note we’ve replaced this survey with one that’s more comprehensive and up-to-date. 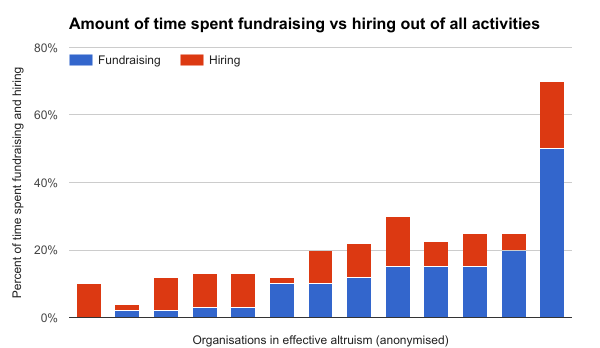 In August 2016, we surveyed 16 organisations in the effective altruism community about their hiring needs, and to what extent they are constrained by talent compared to funding. Note that since the survey was carried out over six months ago, some of the information may no longer be up to date. We intend to repeat the survey in August 2017, and will report back on how the situation has changed. What types of talent does your organisation need? Math and AI researchers, in 2 cases. Policy experts, in 2 cases. Scientists, especially biologists, in 3 cases. Also see the longer list of skill sets needed by the community at the end of this summary. It was frequently noted by the organisations surveyed that they place a lot of emphasis on hiring people who are involved in effective altruism and motivated to do as much good as possible. There’s further discussion of the shortage of software engineers here. For the last person you hired, how much in donations would you be willing to receive to be indifferent between hiring and not hiring them? The average from the 12 responses to this question was $505,000, and the median $307,000 (the distribution was skewed by a few organisations which answered with very high figures). Assuming that an individual is on the same skill level as the people hired by EA organisations at the margin, this suggests that if they could donate more than $500,000 over the few years they would otherwise work at that organisation, it would be better for them to earn to give than to work for an organisation directly. Edit on 27/03/2017: Since the question was ambiguous whether the donations are once-off or annual, we think these amounts are likely to be between an average of $126,000 – $505,000 and a median of $77,000 – $307,000. The lower bound is calculated by dividing the original numbers by 4, the average time spent in a job by someone in their late 20s. We’ll reword this question for the next survey. What proportion of your management team’s time is spent on hiring vs. fundraising? The organisation with the largest time spent on fundraising was recently established and is trying to raise funds to support its expansion. 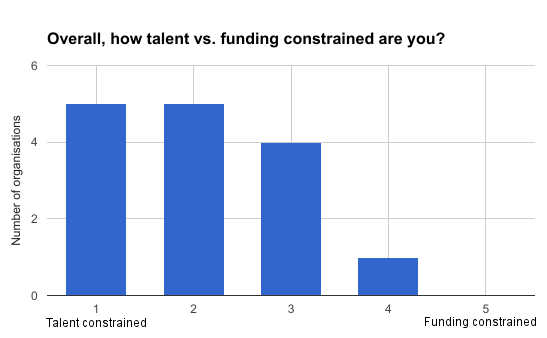 Overall, how talent vs. funding constrained are you? This was defined on a scale from 1 to 5: a response of 1 corresponding to being predominantly talent constrained, 3 neutral, and 5 funding constrained. The average response was 2.1, or 1.6 when weighted by organisation size. This suggests that on average, organisations see themselves as more talent than funding constrained. This finding appears to stand in tension with the answers to the previous question – why do organisations spend a similar amount of time fundraising and hiring if they are (significantly) more talent constrained? It could be that the organisations simply do not think that the right candidates are out there, or it could be that they are underinvesting in hiring. Another explanation could be that they spend a lot of time retaining existing staff – this feels like an activity that aims to resolve a talent constraint, but which is probably isn’t included in the estimates of time spent hiring. What types of talent do we need more in EA? Want to get a job at an EA org? We may be able to help. Just take a few minutes to fill out this form.